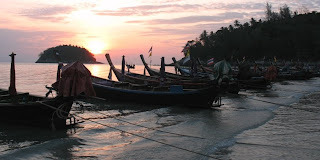 The best time of year to visit Phuket? Another week has drifted by. No exciting weather this week, just sun. A couple of slightly hazy mornings, but the whole week has been perfect weather. Just as it should be. 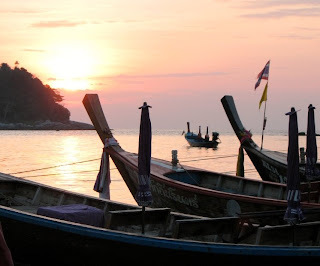 Is this the best time of year to visit Phuket? Well, I think if you want sun, sea and sand, then come NOW! It's hot, but not too hot, there's hardly a chance of rain, winds are much lighter than a couple of weeks ago. From now until April it gets hotter in Phuket and over much of Thailand. The northeast winds ease off and we all slowly cook until we are praying for rain. Now is a great time to be in Phuket, I never tire of blue skies. Weather blog updates are a little slow in the high season, sorry - busy at work and I would hate to repeat "sunny, 32 degrees C" every day. It might just drive you mad if you were in England "rainy, 8 degrees C". Or as an old friend who lives in the NW Territories of Canada said... "it's only cold when the temperature begins with -40 something"... it was minus 30 something when she said that... er, I think I will stay in Phuket.